This listing is for what I call “Linda’s little lamb” planters. There are 3 lamb planters and they have been in my collection for many years. Cute little mini shoe made by Uhl Pottery! 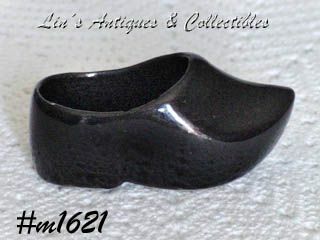 This is the #2 Dutch shoe, measures 3” long, and is black with shiny glaze. Little shoe is in very good condition – has 2 slice type ¼” dings on inside edge – they have been color touched-up. Not noticeable but they are there and shoe is priced accordingly. Nice addition to a collection. Cute little Uhl shoes! These are minis -- measure 2 1/2" long (at longest), 1 3/8" tall (at tallest). 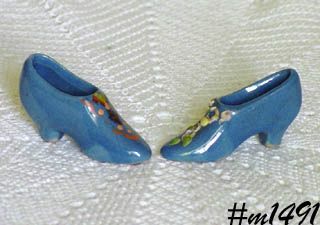 Both are in Uhl's pretty blue color, are shaped like a womans' heel/pump, and both are hand decorated. One is stamped Uhl on bottom, the other is not. Excellent condition -- minor wear to applied floral pattern on one shoe -- that's it! Neat items. 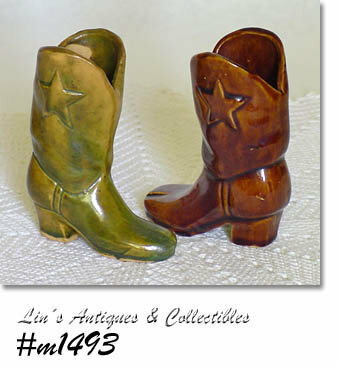 This listing has two Uhl mini cowboy boots -- they are priced individually. Each boot measures 4 1/8" tall (at tallest) and have an in-mold star on each side. One boot is a warm brown color with shiny glaze, the other is green with yellow accents. Neither boot is marked,however, the brown one has (written in pencil) on bottom:Christmas 1942. The brown boot is $160.00, the green one is $150.00.